Experience Indoor Skydiving At Adrenaline And The Sky’s The Limit! Remain sky high in any weather, bypass the wait times and overcome heights-based fears in one fell swoop. For the ultimate thrill in complete state-of-the-art safety and highly appealing low prices, it’s impossible to top the indoor skydiving experience. Adrenaline offers an extensive range of indoor skydiving packages and activities at Australia-wide skydiving centres that are best in class. 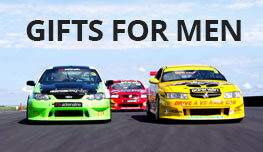 Indoor Skydiving Gold Coast, iFLY Intro Package (2 Flights) - WEEKDAY SPECIAL OFFER! 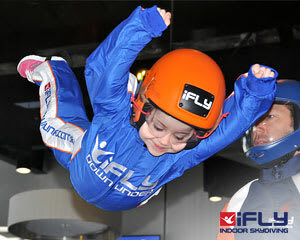 Indoor Skydiving Sydney, iFLY Intro Weekday (2 Flights) - WEEKDAY SPECIAL - NOW FLYING! 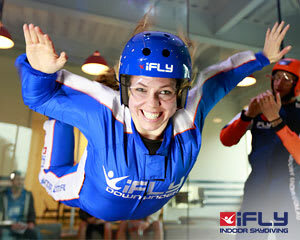 Indoor Skydiving Gold Coast, iFLY Intro Package (2 Flights) - NOW FLYING! 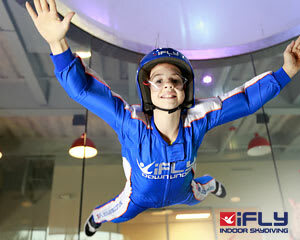 Indoor Skydiving Sydney, iFLY Value Package (4 Flights) - NOW FLYING! Speaking of lessons, indoor skydiving is not only the perfect activity for most ages and fitness levels, but it also makes an ideal learn-to-fly introduction for stepping up to a tandem skydiving experience. High fliers will receive similar exhilaration levels in indoor skydiving activities, such as the Indoor Skydiving Sydney – iFLY Introductory Package (2 Flights). Participants will receive full training, flight suit, goggles and helmet, hands-on assistance from your personal instructor and two fun-filled flights in the wind tunnel. They’ll also be awarded a souvenir flight certificate to prove they took the indoor plunge and developed a taste for more. Friends and family can watch you in high-flying action from the all-glass viewing platform, which is just metres away. This adrenaline-charged package and other virtual reality experiences are offered at indoor skydiving centres in all cities and regional centres. 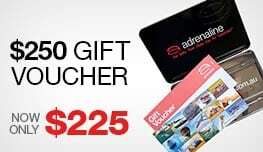 Simply jump online at Adrenaline to book your indoor skydiving event and soar as you save with the great daily specials. What does indoor skydiving feel like? The feeling of being weightlessly air-bound in your customised flight chamber wind tunnel by a constant stream of generated air is equal to the sensation of tandem skydiving, without the extensive training, waiting periods and weather dependency. The wall-to-wall airflow generated by powerful fans in the vertical tunnel creates the same feeling you would receive if freefalling from up to 14,000 feet high: in perfect comfort and safety. Is there a weight limit for indoor skydiving? There are weight limits in tandem with height restrictions at most indoor skydiving centres. Indoor skydivers must weigh less than 105kg if under 180cm tall and your weight is less than 115kg if above 180cm tall. These limits have been set to ensure optimum for precision, safety and exhilaration for the skydiver. Exceptions can be made for weights exceeding 135kg, but only under the approval and guidance of a trained instructor. Indoor skydiving is a perfectly safe and expertly controlled activity. 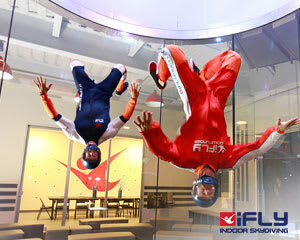 The custom-built indoor skydiving centres are state of the art. They have been created as a training facility for military aerialists, so the exacting science of balance, comfort and endurance is assured in their aerodynamically engineered design. The centres also provide a fun-filled, high-flying and affordable experience for the ever-popular recreational sport of indoor skydiving. Children as young as three years old can participate in indoor skydiving activities and the exhilarating thrill of being buffeted by strong streams of constantly generated air makes for an exciting atmosphere for all group gatherings.